What is the Deal with Gluten-Free? More than likely you have seen the words "Gluten-Free" on packaging. I know in my grocery store, gluten-free products have become so popular that they now have their own aisle! 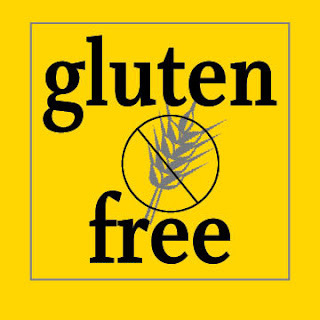 But is this some kind of new "fad" or is gluten intolerance on the rise? I came across this the other day. The web is a powerful thing and bloggers are running it! This shows the importance of having social media linked to your business. Bloggers drive traffic through social media. Then you can easily keep your customers updates. Check it out! Don't wait until you are retired. Be prepared now for your family and yourself no matter what your age. You can get a range of protection and insurance to suit your needs. Auto Insurance- Protect your car and yourself in the event of an accident. The can find assistance for house and yard work if you are injured in an accident. There are have over 1,600 authorized auto repair shops for your vehicle. With a No-Drop Promise you can never lose your policy. Get towing and rentals covered. Homeowners or Renters Insurance- Protect your home and possessions with a protection plan. Your insurance company will pay the actual cost of replacing your possessions with new items of equal quality. Get medical bills covered if anyone should get injured on your property. Life and Disability Insurance- Plan for your loved ones if something should happen to you. The services include, funeral planning, estate guidance, beneficiary counseling, travel assistance and ID theft protection. There is also short or long-term disability insurance. Retirement Plans and Mutual Funds- Make the most of your 401(k). Start saving for the future now. Find out if your employer matches you payments. Business Insurance- Protect a small or large business from fire, theft, lawsuits or injury. Perfect for AARP members. Save money on car insurance, homeowners insurance and more. Get coverage on antique cars. Get an umbrella policy. You could be sued and lose your current assets and savings. This policy will be an extension to your current homeowners or auto insurance. Most carpet cleaners contain toxic ingredients including petroleum solvents and artificial fragrances. Choose cleaners that will be safe for your family and the environment. Pick a green carpet cleaning service like abc carpet cleaning for periodic whole carpet cleaning and use these spot cleaning tips to keep your carpets and rugs fresh in between. 1. Oil- When you get any kind of oil or grease on your rug sprinkle baking soda and let it soak it up. Then vacuum it up. It should remove the whole stain. Repeat if necessary. 2. Gum- If you are unfortunate enough to get a lump of gum ground into your rug then act quick. It will continue to collect dirt and will get even harder to remove over time. Lay an ice cube over it and let the gum freeze. Then remove it in chunks. Repeat if necessary. 3. Juice- Start by soaking up all the juice with a towel. Then use a 50/50 vinegar/hot water solution to clean it up. Use a rag or wash cloth to scrub the area. The rinse and ring out in solution. You can even spray the solution on. 4. Urine- Just like any liquid soak up as much as you can with a towel. Then pour straight hydrogen peroxide onto it. Soak it up again with a new towel. If it still smells you can repeat it or try a vinegar/water solution. You can also try a natural enzyme cleaner like BacOut by BioKleen. *Be sure to do a color test for peroxide. I've used it on all sorts of surfaces and never had a problem, but it's better to be safe than sorry.